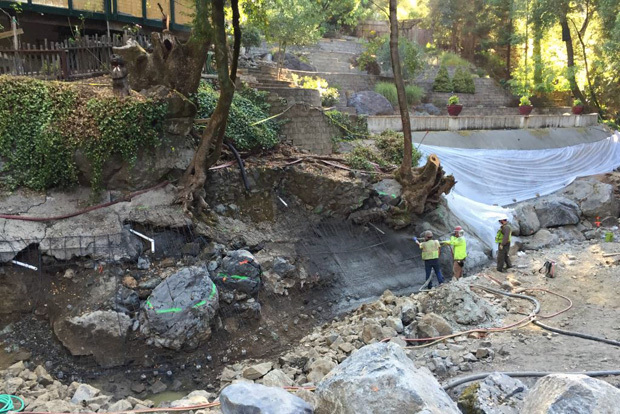 Restoration staff spray shotcrete onto the sides of the main channel of the Mill Creek fish passage in August 2016. 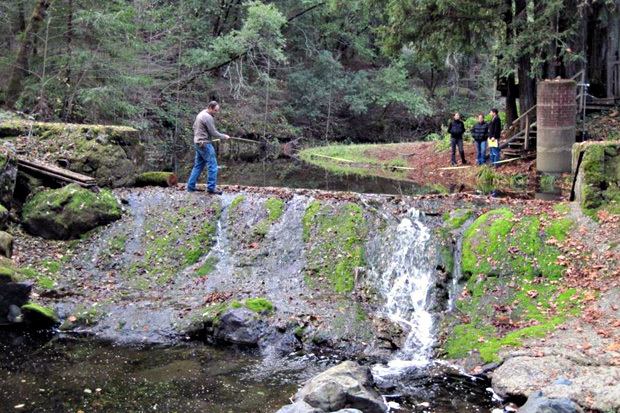 Photo by Prunuske Chatham, Inc.
California Sea Grant biologists fish Mill Creek for juvenile coho salmon and talk about their monitoring program in the Russian River basin, which is part of an interagency effort to restore steelhead and endangered coho salmon. Construction of the fish passage was completed by Trout Unlimited and Prunuske Chatham, Inc., who conducted years of planning and negotiations with local property owners. Funding was provided by the NOAA Restoration Center’s Community-based Restoration Program, the California Department of Fish and Wildlife’s Fisheries Restoration Grant Program, and the Sonoma County Water Agency. Local landowners made a key contribution by providing access to the restoration site, even allowing heavy machinery to cross and operate on their property. First flows through the side channel at the Mill Creek fish passage in October 2016. Photo credit: Joe Pecharich, NOAA. 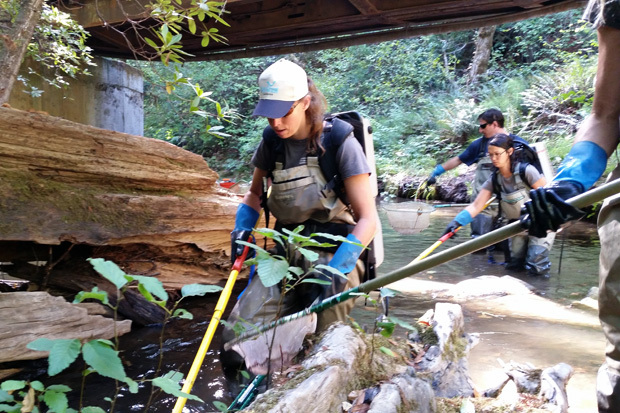 California Sea Grant fisheries biologists (left to right) Mariska Obedzinski, Andrew Bartshire, and Desiree Dela Vega survey for juvenile coho salmon and steelhead trout in Mill Creek in October 2015. Photo credit: California Sea Grant. That’s a promising start to a new phase of recovery for the Russian River’s once prolific salmon runs—coho, Chinook salmon, steelhead trout and all. NOAA’s California Sea Grant College Program funds marine research, education and outreach throughout California. Their headquarters is at Scripps Institution of Oceanography, University of California, San Diego; they are one of 33 Sea Grant programs in the National Oceanic and Atmospheric Administration (NOAA), U.S. Department of Commerce. This article was first published on their website, and we are re-using it with their permission. Coho salmon are one of California's most endangered native fishes. In Mill Creek, a Russian River tributary, their life cycle has been broken for decades due to a dam that prevents access to higher stream elevations that do not dry out in the summer. 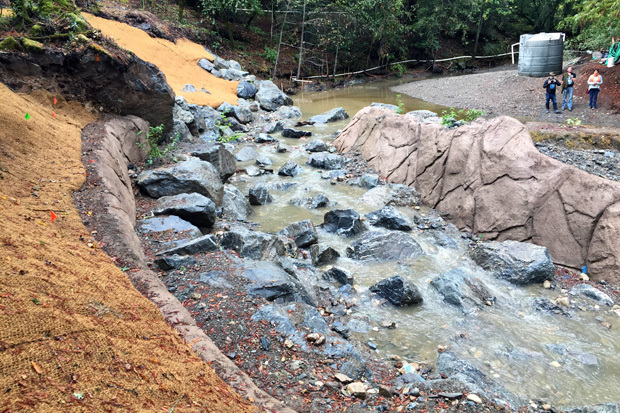 A new bypass has restored flows between the lower and upper parts of the stream. This fall is the first time in decades that migrating coho salmon will have the chance to reach these spawning grounds.